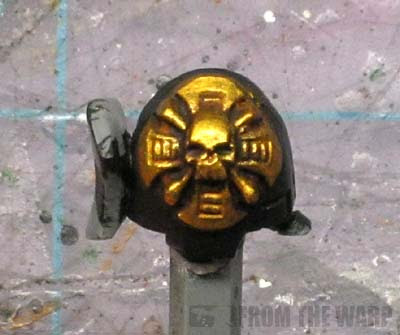 I was asked the other day how I painted the gold on the crozius for the Dark Vengeance Chaplain I posted. I've actually got a couple different ways I paint gold. This is the method I use for quick, tabletop results. 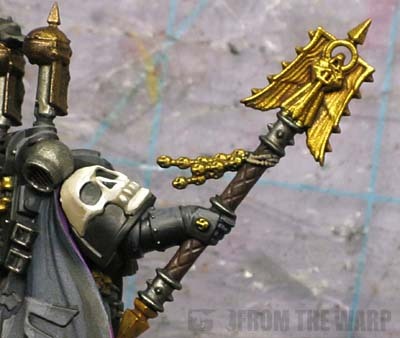 There are tons of ways to paint any metallic, but this is my "go to" method for quick and basic gold. It's worth noting that this method yields a warm, bright gold in the end. While it might look like a bunch of steps, they are super easy and the biggest problem you'll have is waiting for your washes to dry. You aren't going to need much and I'm almost certain you have the four colors/washes already in your collection. For the base, I use GW Shining Gold. I believe it's Gehenna's Gold now in the new range. Other than that, you'll need a dark brown and two washes, Seraphim Sepia and Agrax Earthsahde. Priming can be any color based on the predominant color your model is. This is not a worry for us because we're going to go over our gold areas with our dark brown anyway before we start applying any metallics. 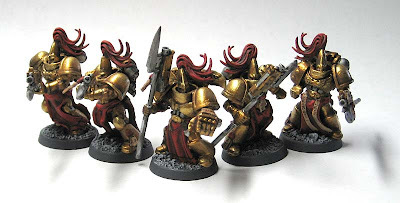 Once we have our model primed and we've come to the point where we are going to work on the gold sections, I base those with a dark brown color. Any brown will do and depending on what shade you choose, it has the potential to affect your final gold color. I've used light browns, reddish-browns, greens, blacks... all kinds of colors under gold for different effects. Each has their own pros and cons and creates and slightly different look in the end. Once we have our gold areas based with brown, it's time to add the gold. I don't worry about getting perfect coverage since my dark brown can act as my shadow color in the recessed areas if I miss a small spot. Once the gold dries, I go over it with two washes. The first one is Seraphim Sepia and I cover the whole gold area liberally. Once that dries, I apply Agrax Earthshade to the deeper recessed areas only. In this case, it was right around the skull. Make sure you give your washes plenty of time to dry. When they're dry, it's one last step of a light drybrush using our original gold color to give the gold some contrast and make it pop. It's a simple method that get's pretty good resutls quickly. Those are my favorite techniques. You can expand on this one to include any number of additional steps, but if I had to add one more, it would be a second (very light) drybrush of silver over the most prominent edges only. This will make the gold look even brighter. And for those folks wondering how this technique scales up from an icon to a whole infantry model (say you were doing a Custodes force)... it works perfectly. Very nice! As a devoted son of great Father Nurgle myself I'm not sure how often I have cause to use gold on things, but this looks to be a very effective method; thanks for posting it. Father Nurgle appreciates his gold offerings ruined in glorious rust. You can use green and purple washes for this. Absolutely. P3 makes a great "gold" color called Blighted Gold. That's my favorite color when I put it on my models... even my non-Nurlge ones. Thanks for posting yet another clean, quick and clear tut of a time-saving technique that also nets great results. Another tutorial to add to my growing list from you. The double wash technique is one I never thought of. In the past, folks always told me my golds were flat, because I simply washed with Sepia and then went back in my base color. Everyone harped that I should be using Devlan Mud (Earthshade now?) instead of Sepia. I tried to explaint hat I wanted a more copper-tinted gold, not a dirty gold. The additional dark wash after Sepia never crossed my mind, til today. What is your favorite band of metallics, by the way? I've found the Reaper Master Series that I use tends to not sparkle so much. svartmetall: Nurgle sports gold... you just need to go for a different look. More tarnished and slime covered so to say. TheRhino: The double wash is there to creat some depth and keep the gold from going flat. As far as a favorite brand of metallics, I like GW Leadbelcher for my silvers and this gold is GW as well. My personal favorite gold is P3 Blighted Gold though, but that's just because of the color it is. Haarspalta: An excellent way to get another form of gold. I use that approach when I want something a bit more war torn and weathered so to say. It's not as shiny or clean in it's appearance. Extremely helpful, I just happen to be painting gold right this second. Excellent, glad it helps! Would love to see what you come up with especially if you end up using this method. A fun one is to sometimes chuck in a wash (or all your washes) as Ogryn Flesh, or whatever the new one for that is called. It gives you an amazing blood-gold finish that helps set or follow the tone of the rest of the mini, or to break up different gold bits so they don't all look the same. P3's Blighted Gold, highlighted with the darker GW gold and then washed down with pretty much any colour makes for amazing Chaos/Nurgle gold. Amazing. The trick is to highlight first, wash second, so the highlight then ties back in. Faolan (Jake): Excellent point about highlighting and then washing to tie the highlight back into the base color and pull everything together. 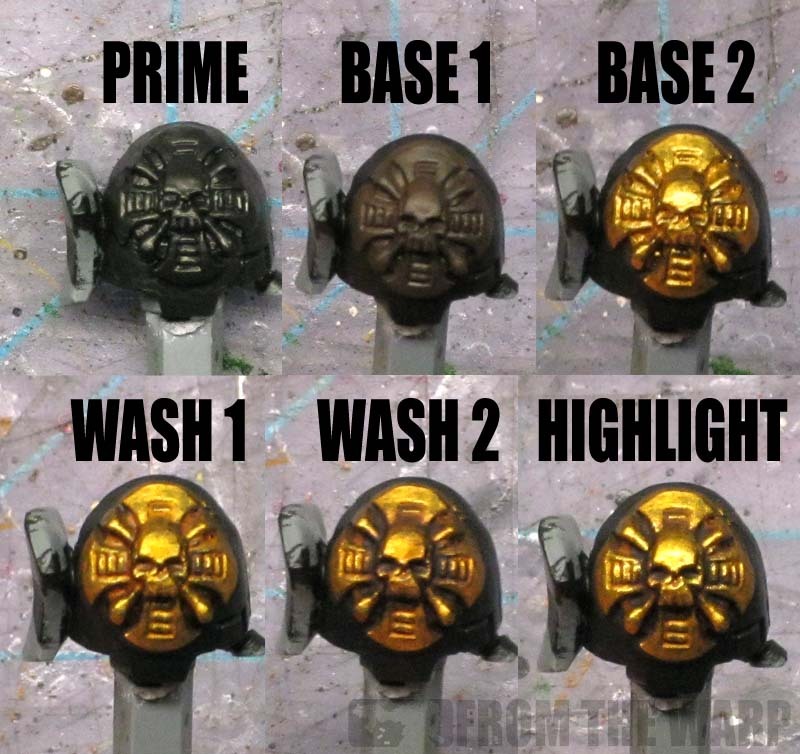 Definitely going to try this in the next week or so, but going to try swapping the brown washes for a pair of purple ones so it looks like it's reflecting from the armor.